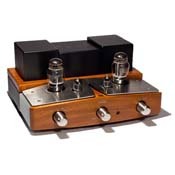 Unison Research produces some of the most beautiful integrated amplifiers out there. Even better, they sound as good as they look. I had the Smart 845 amps and Mystery One preamp for several years until I had to sell them do to space consideration. I missed them everyday. So when I had the chance to purchase this Preludio second hand from the original owner I did not think twice. The Preludio continues Unison SET design with a 14 watt output. The low output requires efficient speakers or with a bening load. I am using it with a pair of Bosendorfer Wall. At 86db the Bosendorfer is not highly efficient, but it's impedance is very stable and the Preludio makes them sing. It has great bass, outstanding pace and rythm, and gorgeous to look at. Hard to believe you are listening to just 14 watts.